I also got the new LHN design Rose Hill Plantation and earlier in the week before I knew I was going up there I got the last two BBD stockings. So I think I have plenty to keep me busy... at least until Market at the end of the month! :) Well, I'd better get to bed. Write soon! What a pretty floss toss, Nicole!! You've been getting some tasty goodies lately--can't wait to see what you start next after C@HRH! Hi Nicole. I love youre blog!! I visit it every day and i love youre pictures, they are so bright! I have a blog to and put a link to youre blog on it. Beautiful fabrics, Nicole! 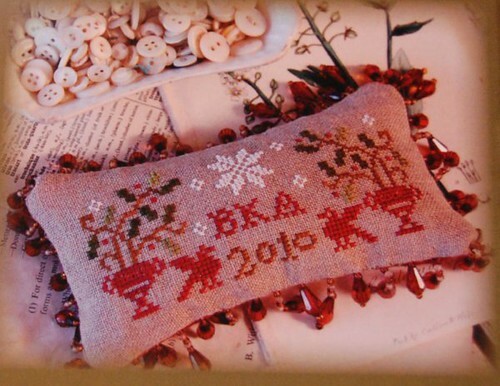 They will make a gorgeous tote bag! I hadn't seen the new BBD LF so I'm glad you picked it up and shared a picture. Looks like you'll have enough to keep you busy! Love the fabric for the tote bag. Ahhh new stash. Nothing like it. Oooooooh, I love the fabrics! They'll make a beautiful tote bag! Great new stash too! Oh I love that fabric!! There are way too many pretty fabric lines out there. I think you're smart to ask Amy to make the bag for you -- sounds good to me! Good stash too! I love that new Loose Feathers! Nicole, those fabrics are just gorgeous! I'm going to have to look for them! They will make such a wonderful bag. I just saw the BBD piece at my LNS but didn't buy it - shame on me. I bet you just had the best day!! Between the bags and the BBD! LOL! The material is wonderful and I know that the bag will be a real stunner! The fabric is beautiful! And I love the new Loose Feathers! Can't wait to get mine! 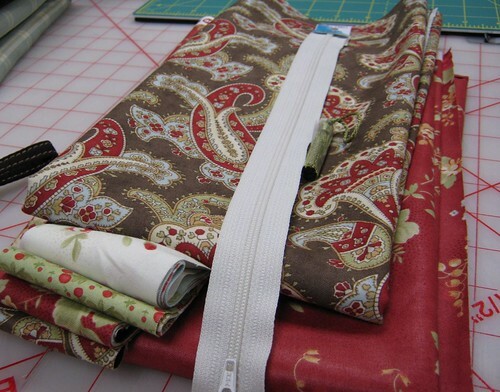 The fabric is lovely and the tote is going to look fabulous. Wonderful stash! I like the new BD LF. I'm sur eyou'll have it stitched up in no time at all. The colors are absolutely gorgeous! I love the fabrics as well. Beautiful fabrics, Nicole - I really miss living near a quilting store - I would love to get some of that fabric and have my mum make me a tote bag. Thanks for the enabling on the new LHN design! I love those fabrics you picked out for your bag. I popped over to Amy's blog and looked at her bag and WOW! love it! Wonderful fabrics you have there. Those just look great. I love the new Loose Feathers too. That will be a fun one to stitch. That is going to be one gorgeous bag. You chose some lovely fabrics, Nicole! Ooooh, you already got the Loose Feathers! Now I'm jealous. 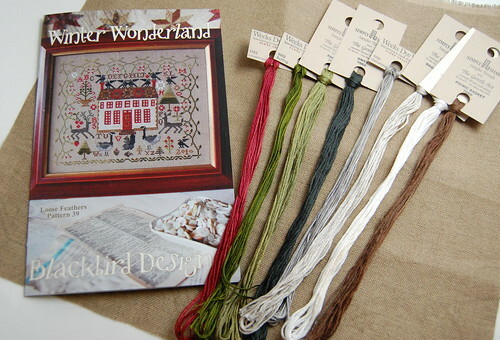 I'm looking forward to getting the new LF chart, it looks lovely and I love the little pincushion charted with it. Great going on the HRH, you'll soon be finished! The fabric for your bag is lovely - you can't beat MODA. Can't wait to receive my LF#39. Thanks for the pic of the cover. Love the fabric!! The tote bag will be beautiful. And I think those threads for the new Loose Feathers are so pretty on the fabric. What fun! I can't wait to get that new Loose Feathers. So pretty. Love your fabric and floss. I think I need a new tote bag! That's going to be one gorgeous tote! Sounds like a great time, Nicole! I love the new stash, and the tote is going to be gorgeous! Sounds like you and your friends had a lot of fun. I LOVE that fabric... especially that paisley one on the top. Looking forward to seeing your tote bag. Isn't the new LF design pretty? This is one of my new favorites from that series, although I tend to love them all. I have ordered that one too and can't wait to get it and start it. Oh Nicole, that bag is going to be scrumptious. All that lovely red! I love the BBLF design, too. Can't go wrong with Starbucks! I love the fabrics you chose for your tote. Such a lovely little oincushion. I love your creative finishing with the beautiful beads.